I am testing out a new type of clip in hair extension that only requires three wefts, which is much easier to manage. I will write a full review once I’ve tested them long enough. 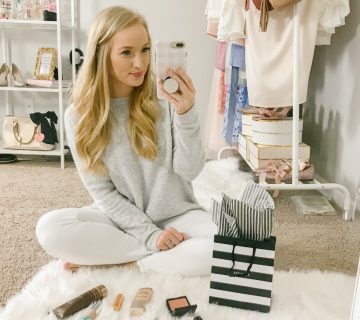 If you’re on the market for hair extensions, I recommend reading this review to see what I’ve been using and prefer for over the last two years. 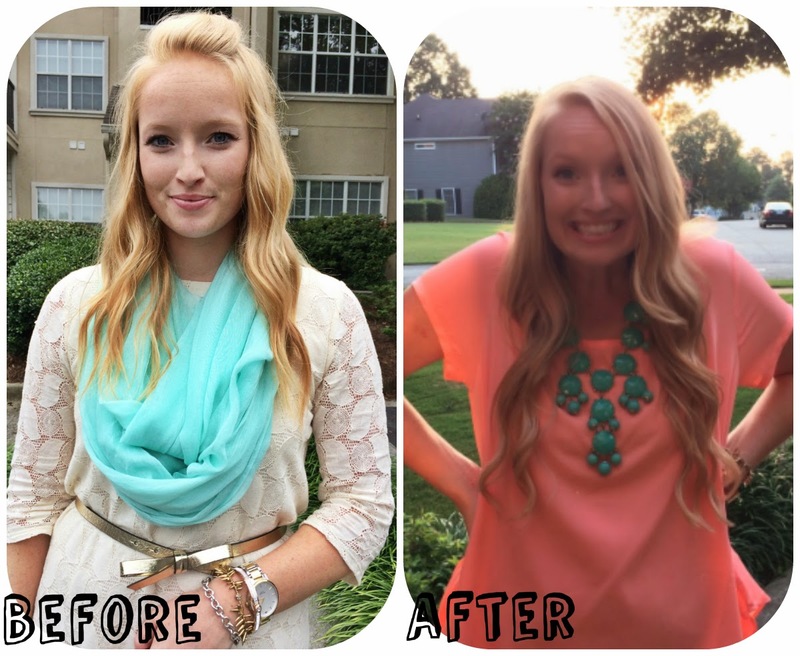 I purchased Bellami hair extensions back in May and mentioned them in this favorites post. Before purchasing, I did my research and felt they were the best quality at a reasonable price. Plus they actually had a promising strawberry blonde color to match my hair (which more or less made my decision for me). I ordered the 120g 18inch extensions because I figured would be more than enough hair for me. My hair is somewhat long on its own, but it has a very fine texture and looks stringy most of the time if I don’t cut it every 5-8 weeks. These extensions allow me to have the HEALTHY looking long hair I’ve always wanted, but also check out my recent post on tips to grow long healthy hair here. Although I do love them, there are definitely some key points I want to point out so you know what to expect before buying hair extensions in general. The rumor is true, these extensions really are thick throughout the entire length of hair. I compared them to extensions at Sally’s and the Bellami hair extension is thicker. Since this is the main reason I wanted extensions, this is first on the list! I have always preferred to style my hair curled in order to create more volume. Luckily, these extensions hold curl better than my real hair and don’t even need hairspray. I usually apply hairspray to my hair before putting in the extensions to avoid excess product on the extensions and to help my hair hold the curl. I was SO skeptical to order hair extensions online because I have a somewhat unique natural hair color. This is really why it’s taken me so long to try hair extensions to begin with. I really didn’t want to deal with having a hair stylist dye them for me. Bellami had a good array of color options with multiple tones throughout them to help them blend in. Each set also comes with a trial strip to try in your hair before opening your full set of extensions and voiding the return policy. Even with my silky fine hair, I don’t have an issue with the clips sliding out. They each have a rubber grip in them and I don’t need to tease or hairspray to keep them in place. Having good customer service is required for an online company to last. When I first noticed a few loose clips in my first set of extensions, they didn’t hesitate to send me another set. Plus, their emails are always energetic and personable. As mentioned earlier, my hair is fine and silky. It was weird having a different hair texture that would wave after getting wet. It’s important to consider this if you live in an extra humid environment and have the right products to use. I sometimes have the issue where the extensions are still curled and my hair has fallen out. One thing I’ve noticed is how the Bellami hair extensions are pretty high maintenance. I always make sure to have a wide tooth comb with me because they can start gathering and look a little fake. A quick brush through always does the trick, though! I also prefer my own hair brushed out so this may be a personal preference. My head will start hurting after a few hours of wear.When I get home (or in the car) and take them out, it’s equivalent to the feeling of taking your bra off at the end of the day! Alright, now for the before and after photos, which I think speak for themselves. Even with the weird black strands, I would still highly recommend Bellami Hair extensions to anyone who wants thicker and/or longer hair. Bellami states their color options are treated in a way to help blend into your hair, and because they match my unique hair color I truly believe there’s a color to work for everyone! 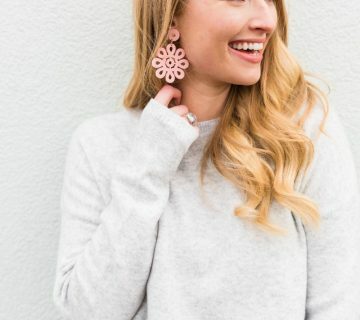 They hold curls without hairspray and stay in perfect condition with minimal work required – I store mine in a banana clip and rarely wash or use a product on them. In the picture below, I only have in 3 clips out of I believe 8! Not to mention I have the lightest weight (grams) of hair offered. Apart of me wishes I got the higher grams to wear less pieces, but I think I may have been overwhelmed with all that hair initially. If you’re interested in purchasing Bellami Hair Extensions, visit their site here! Great review! I wear Bellami hair extensions too and I love them! Your review is very accurate. I haven't tried any other types of extensions but I love these. I have had mine for 10+ months and they are still in good condition! I've never tried hair extensions before, but what they look lovely on you! Thanks for the tips! I enjoyed reading about this because I've never tried them and always wondered how they work..sounds like they're worth a go! Your hair always looks great! I have some extensions right now and I had a feeling that belami would be somewhat like the "foxy locks" i ordered back in college! I believe those black coarse hairs are the result of the fact that this is Indian Hair. When places like this pride themselves on "virgin hair" you get really excited because you think you're ordering white girl hair, but you're not, it's just Indian peoples hair which is why it's so coarse! They look great though! I never would have noticed! The anxiety thing IS REAL! I am so upset because I just typed out about 2 paragraphs worth of my thoughts on extensions, and it did not post (sad face) Anyway, I am 17 years old and have been wearing/trying out different brands of extensions since eighth grade, and Bellami is BY FAR the most beautiful, soft, true to life set I have ever owned. I have tried the Remy hair, Euronext, and Bellami, so take it from someone who has experience. You cannot go wrong with Bellami!!! I feel so frustrated at the people who have posted bad comments because I just do not understand how we could have the same brand of hair. These extensions are so beautiful!! Everyone I know is in absolute awe of them. Well, there will always be a good and bad in everything. But as long as it provides more benefits than drawbacks, then I guess it’s worth giving a shot. Hair extensions look good on you, Amanda. That reason may be suffice to say it’s worth it, though I think you could improve your experience by finding a more effective means to maintain it. 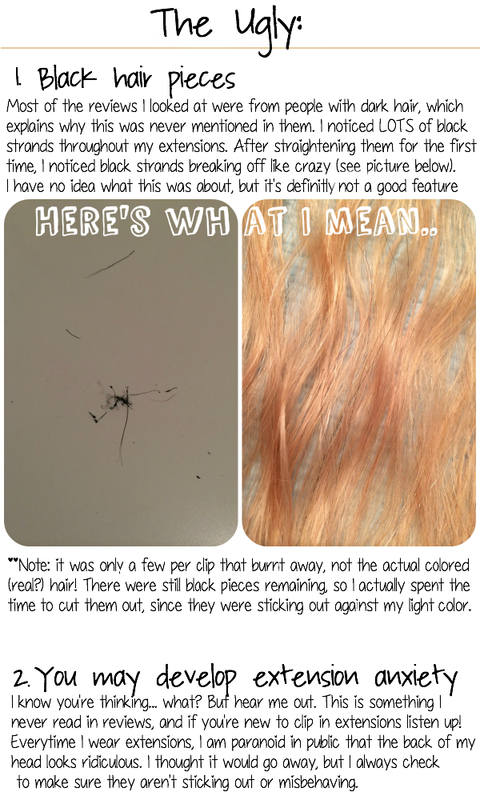 After reading your review and basing off of previous reviews I've read, I believe those black strands you mentioned are burned fake hair. Some of the other reviews mentioned that some of the wefts have strands that don't look real and have that plastic look to them. This would make sense since you didn't notice the black strands until you straightened them. What heat setting did you use? I'm betting you burned out the fake strands. If that's the case, Bellami isn't being completely honest about selling 100% human hair. The benefits of Hair Extensions are they attached with the other roots and there are no side effect of it. Great post! I just ordered mine before I read this but pleased to hear you would recommend!! Hair Extensions Perth-solid reputation as the market leader in hair extensions in Gold coast, Perth. Hurry up! Book an appointment online and GET 10% OFF. That’s so beautiful, i must say Hair Extensions just changed your look and it’s awesome. I also wear hair extensions and moreover i love to wear them. I live in London and I always buy my Human Hair Extensions online as most of the sellers offer hair extensions at very affordable prices. Really very nice post thanks to share this post its information is really very nice useful. And image example is really very nice and attractive. I really love your post! Please visit this link below for awesome hair extensions. This was a very informative post. I am defo going to add these to my online store and also try it out for myself because sometimes i cant deal with the sew-ins. Thank you very much, this was a very good read.